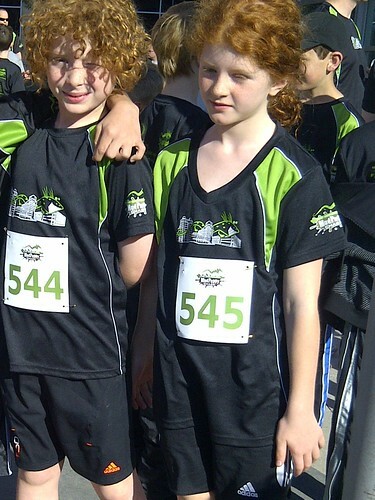 This weekend my big kids ran their first race. Signing up was of their own initiative — inspired by friends. Albus raised quite a lot of money, also of his own initiative, for the cause (Kidsability). They trained regularly with friends in the weeks leading up to the race, sometimes led by a parent, but also on their own. And on Sunday, they each ran their own very individual race, according to their unique personalities. Albus stuck with a friend. He finished in good time, with faster splits than we’d been doing our training runs (5:43/km), 162nd of 540 runners. Here is a classic Albus-defining moment: As he approached the finish line, he found Kevin in the crowd and stopped to wave. By contrast, AppleApple was so focused in her sprint for the finish line that she had no idea anyone was yelling her name and cheering her on. She ran entirely on her own, and much faster than we knew she could (4:40/km), finishing 50th of 540 runners. Both children loved the experience, and want to do it again. I love that they each did it their own way, and that each came away happy and proud. To thine own self be true!